Sipapu Natural Bridge, early March. Being well into my second year of living in southeastern Utah’s canyon country, I feel qualified to express a few things. My favorite seasons of the year, as always, are autumn, spring, winter, and summer. Yes, in that order. I appreciate them all. But I sweat heavily while hiking in summer, and it can sometimes seem more like a bridge between the new life of spring and the glory of autumn colors. I love it too, even so. I am experienced enough in the high desert climate to take lots of water and salty snacks (electrolyte replacement, quite important) when I hike. Pool reflection, Serenity Canyon, Natural Bridges. This past fall, after a glorious spring and summer here in the high desert canyonlands, I suddenly felt blue. I wasn’t expecting to feel that way, it just happened. Such an amazing visual ride for months…and then…suddenly the last leaves of the cottonwoods, Single Leaf ash trees, the shrubs, the brown grasses from earlier in the season…gone. My awesome canyons seemed so drab all of a sudden. I longed for the first snows to brighten things back up. They came, and early, thankfully. Gorgeous snowstorms which I have documented on this blog a while back. Then the winter moves on, but the green of spring has yet to arrive. The second in-between the colors time. The spring version. Early spring, late winter. However you’d like to frame it. But as always there was the ace in the hole: the trademark Utah high country blue skies. With that in mind I once again descended the trail down to Sipapu Natural Bridge — second largest in the Americas, sixth largest in the world. To see how things were. In a place as special (and relatively unnoticed) as this you can almost have the canyons and cliffs to yourself. Especially at this time of year. Five hundred feet down in elevation to the bridge. Done. Appreciating it again, with my camera in addition to my soul: done. Beneath the mighty bridge, the trail takes the casual visitor downstream. It’s a great hike. But I had a different date. I turned hard right up an unnamed side canyon that I love. Since it has no name on the map, I am naming it Serenity Canyon. Few people go up there, despite the ease. I had walked it last year, and I felt slightly guilty that I’d procrastinated this long before returning. We all have our faults, our distractions. I could tell nobody had been up there by the well weathered tracks in the sand of the canyon bottom. And there were few, even so. I was the first on this early spring afternoon, and I intended to make the most of it. Swirly-whirl pool in Cedar Mesa Sandstone, Serenity Canyon. I was soon halted by a big pool of water. The snowmelt had filled it, and I was captivated by the reflections of the canyon walls. Tough lighting: deep shade and bright canyon walls above. I was able to skirt the pool to the left, ducking beneath some cottonwood branches. Gradually up the canyon floor. Eventually I was halted by a pour-0ff ledge. The remaining ice blocks were on the floor. I chastised myself for not being up there earlier. Last of the ice waterfall, Serenity Canyon. Looking back downstream, I admired the bands of Cedar Mesa sandstone seemingly swirling around the pool of water. I made a number of exposures. Experimenting. Then back down the canyon. And came upon some wildflowers that I’d walked past while going up the canyon, gawking at the stone walls above. Embarrassed that I’d missed them. But why should I be? Back underneath Sipapu Bridge, I enjoyed some reflection shots of the mighty stone arc. While my boots slowly sunk into the mud of the stream. Sipapu Natural Bridge, from upstream, White Canyon. The afternoon was late. I needed to say goodbye to the canyon bottom (for now) and hike back up out of it. Only 500 feet up to go, I reminded myself. What goes down into the canyon must go back up. I love the exercise. In my soul I like to feel that the canyon likes me, too. The appreciation. The alignment in energies. What a beautiful, inspiring place. The relatively few visitors express amazement. They vow to come back, to spend more time here. They often do. Meanwhile, I’ve had the extreme privilege to live here. Season after season. Moonrise over the Bears Ears Buttes, Feb. 20 at 5 PM, two days before Full Moon. It was once again Full Moon time. Usually the best day for moonrise landscape shots is the evening before the Full Moon — the day before, rather than the day of Full Moon. Two days before (Feb. 20), at 5 PM, an hour before sunset, the almost-full moon was rising over the Bears Ears Buttes, as seen from the Visitor Center at Natural Bridges. Moon rising over Bears Ears East Butte at sunset, Feb. 21. I once again turned to The Photographer’s Ephemeris (PhotoEphemeris.com) to help me plan my shoot for the following evening, Feb 21. The moon would rise about 56 minutes later than the previous evening, almost at sunset. The Photographer’s Ephemeris also tell you the azimuth — the compass direction — that it will rise at. That helps immensely as far as getting in position to have the moon rise near an especially attractive landscape feature. In this case, the Bears Ears Buttes. Moonrise panorama, Bears Ears Buttes. The only problem with having the time and azimuth of moonrise to work with is that it’s only exact for a flat landscape, like an ocean or the plains. If there’s a mountain in the way, the moon won’t be visible until it gets up high enough to clear it. And the moon doesn’t rise straight up, it arcs toward the south, here in the Northern Hemisphere. Full Moon rising over Bears Ears East Butte. I had been hoping to position myself so that the moon would rise directly between the two buttes. But by the time it came up that night it appeared over the right shoulder of Bears Ears East Butte from where I was standing. Oh, well, it would still make for an awesome scene. Moonrise and last rays of sunset on the Bears Ears. By the time the moon rose over the butte, it was almost sunset. The low angle of the sunlight put a somewhat golden glow on the landscape. Then the sun was down and it was time for a twilight shot. Moonrise at dusk, Bears Ears. I had been blessed with clear skies for this shoot. Since I had the next day off I would be free to travel. The following evening the moon would be rising at dusk, 15 minutes after sunset. By the time it cleared the mountains I had in mind, it would be very nearly dark. Still, it was worth a try. So to Canyonlands I went. Stay tuned. Nori Sasaki at Natural Bridges Visitor Center. A visitor came in to Natural Bridges and said, “You have a celebrity on his way in here.” What? Who? Is President Obama coming to check our area out before he declares a Bears Ears National Monument around us early next year? No, it was a Japanese man that was pulling his “cart” across America. And he did indeed arrive at the Visitor Center not long after. Fit as a fiddle, with an irresistible smile, but only workable English, I asked him about his trip. He wasn’t, it turned out, walking across America (the U.S.). He was walking the Americas from north to south. He’d started at Prudhoe Bay, Alaska, on the shores of the Arctic Ocean, eight months ago–June. He was headed all the way to the southern tip of Argentina, a total journey of three years. Park Ranger Steve Lacey was fascinated by Nori’s outfit and quest. Underneath the Alaska license plate is one from Okinawa. His name is Norio (“Nori”) Sasaki, from Okinawa. He has worked as a lifeguard and in ski patrol, and he feels like protecting others is his duty. Nori stayed in the park’s campground at my suggestion. He has been camping along the road–yes, even in the snow–all the way along his journey. He cooks his own meals, too. To stretch the money he has saved for his journey. He’s not soliciting donations. He’s self sufficient and happy. Nori Sasaki leaves Natural Bridges on his way southward through the Americas. The “cart” (a modern day rickshaw, I think) allows him to bring along more necessities than the largest backpack could carry. But it’s human powered, no gasoline to buy. Nori averages 25 miles per day pulling that 160 pound rickshaw! On favorable grades he trots along, he doesn’t merely walk. I have been in a career that protects the safety and life of others. I have worked as a ski patrol and lifeguard. To protect and care for others I need to be strong both physically and mentally. Strength gives me confidence in rescuing people. I believe strength also gives my mind room to afford caring for others. I train myself through my journey on foot in harsh conditions to be strong and to never surrender. I want to live my only life to the fullest to meet wonderful people and great nature. No scenery is as moving as one you earned upon hours and hours of hard walking. While traveling I have met lots of caring and helpful people. The geographical borders seem irrelevant when it comes to caring and helping others. I also want to do the same for others. I appreciate the encounters and will continue my journey on foot to my limit with smiles. I especially like that line “…strength also gives my mind room to afford caring for others.” Wow. It’s a Quest. He could continue to stay strong by working out at the gym, and running every day! I think it’s more about the “to meet wonderful people and [experience] great nature. After his night in our campground, Nori went around Bridge View Drive to see the three magnificent natural bridges. Then he returned to the Visitor Center with more questions. I got out detailed maps of the next part of his journey south from here, and showed him some great camping locations I’d been to. And then it was time for him to be on his way again. I found myself almost dreading the moment, getting a little choked up. His English wasn’t good enough for us to keep in touch, but I gave him two small prints with my email address on the back, just in case. Norio Sasaki leaving Natural Bridges on Utah Highway 275, beneath the Bears Ears Buttes. Moss Back Butte, from Natural Bridges Visitor Center. After a very cold night in the single digits Fahrenheit, the morning was absolutely calm, no breeze. As the sun illuminated the snowy landscapes around Natural Bridges, the hoarfrost that had formed on everything overnight glowed in the early sunlight. Cottontail rabbit behind hoarfrost-coated Rabbitbrush. That’s when hoarfrost forms: cold temperatures combined with high humidity and no wind. Pinyon pine cones and hoarfrost. Which brings a gorgeous sunny morning with the sun lighting up the frost crystals. Scrub Jay on a Pinyon pine twig. The freezing cold doesn’t feel near as bad without a breeze, let alone wind. By comparison it feels quite comfortable. Cottontail rabbit tracks and Rabbitbrush: signs of mid-night feeding. The Bears Ears Buttes, above Natural Bridges. A weekend storm blasted in about a foot of snow over two or three days, depending on how you counted when the first storm started and when the second one, which was right on the tail of the first one, ended. Mouth of Deer Canyon at White Canyon, Natural Bridges. Lovely! Natural Bridges National Monument in southeast Utah is an outpost. A self sufficient community. It was the first National Park Service unit to have a solar panel array installed to provide its electricity, in 1980, back when such a project was very expensive, and so was considered a pilot project. Owachomo Bridge from the overlook, Natural Bridges. Thus when a big winter storm hits Natural Bridges, the power does not go out. We enjoy it. White Canyon from the Sipapu Bridge viewpoint. 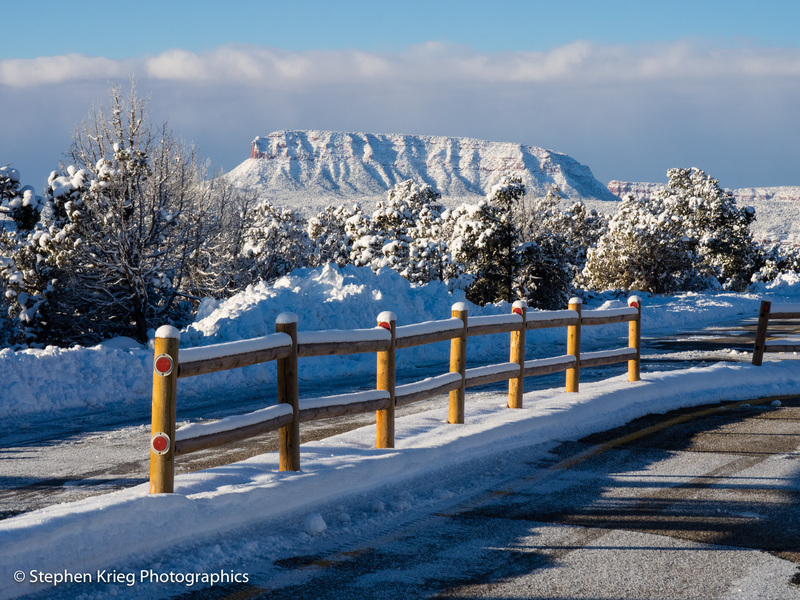 Afterward, the sunny skies show the new snow coating on the canyons and buttes in all their glory. The National Park Service crew keeps the roads and walkways to the overlooks cleared for the visitors to enjoy. Kachina Bridge from the overlook, Natural Bridges. Frozen pool in lower Armstrong Canyon in January, at Natural Bridges. I was hiking back down into White Canyon to revisit Kachina Natural Bridge in January. But first, a side trip: Up the lower reach of Armstrong Canyon, which joins White Canyon at the Bridge. Ice falls at the nickpoint pour-off, lower Armstrong Canyon. One can only walk a short ways up Armstrong there before their progress upstream is halted by a pour-off, an overhang that has a waterfall when the stream is flowing. Ice falls and reflection, Armstrong Canyon. This stretch of frozen stream bottom is an easy to get to, but still secluded, spot in the canyon. Usually you have it all to yourself. Snowy stream banks, lower Armstrong Canyon. The frozen pools along the way were a treasure trove of frozen patterns: ice crystals, under-ice air pockets, leaves frozen in the ice, partially melted ice over stones. Moss Back Butte, from Natural Bridges Visitor Center parking lot. (Click on image for larger version). The things I like about snowstorms are: 1) the approach and anticipation, 2) watching it occur, and 3) the aftermath. So, I guess I like everything about them. Natural Bridges National Monument Visitor Center. Mind you, I live in a place where the power can’t go out, because we have a solar array with battery storage, plus diesel generator backup to that as well. And we walk to work, just a short distance. We are off the grid and self sufficient. We stay stocked up on food and are nourished even further with some of the most beautiful scenery imaginable. 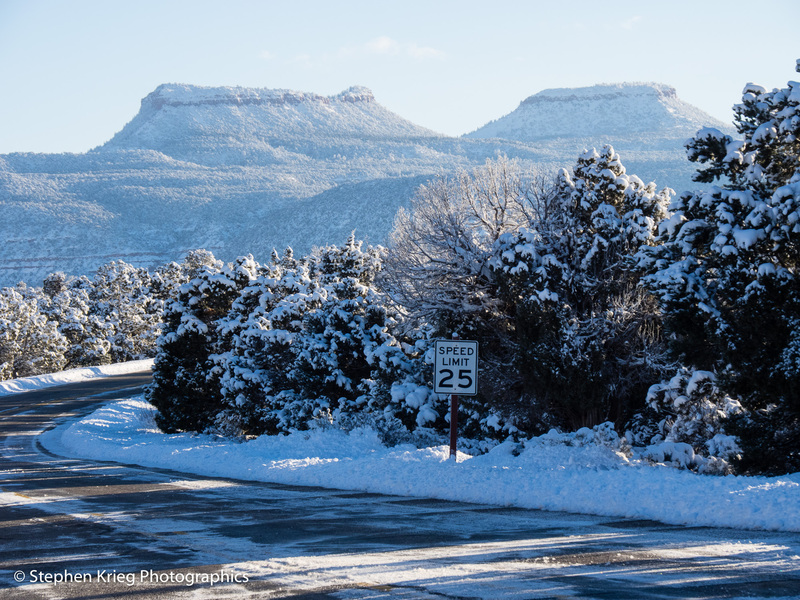 The Bears Ears Buttes in snow, from the Natural Bridges parking lot. Natural Bridges National Monument in southeast Utah is way out there in the middle of nowhere. Even today visitors stop in amazed (sometimes uncomfortable) with how far things are around here. It can be a haven along the long lonely but spectacular road that is Utah Highway 95 between Blanding and Hanksville. 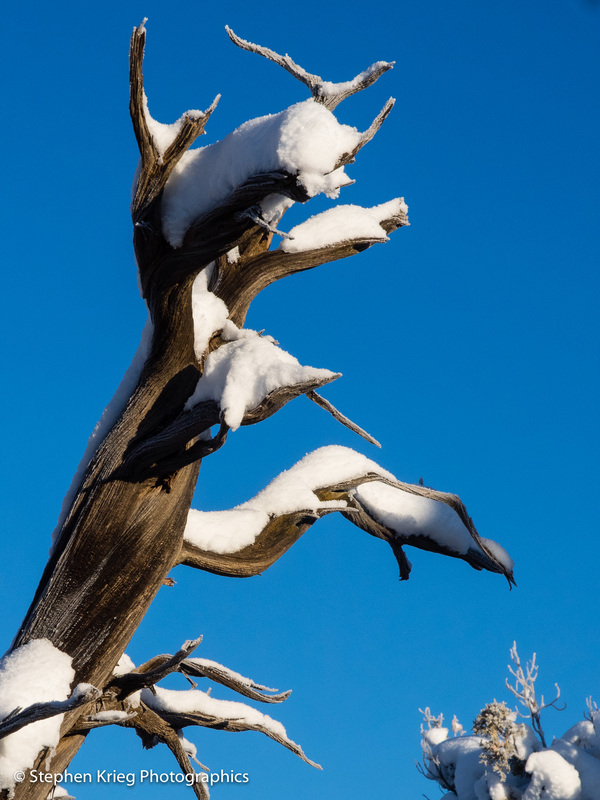 Juniper tree snag in the snow and sun and blue sky. It’s the dead of winter here. Few visitors arrive. But those that do are amazed. I am still amazed, too, and it’s my second winter here. 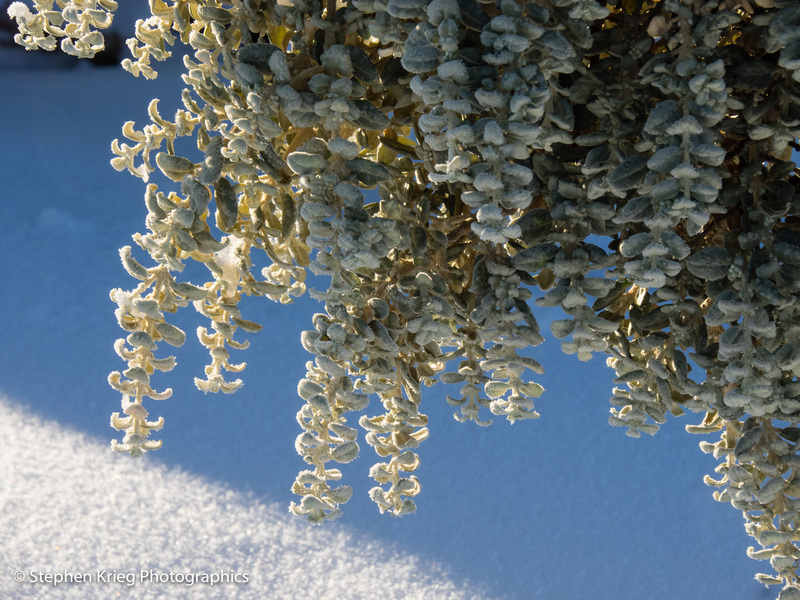 Roundleaf Buffaloberry bush on a winter morning.